One of the largest National Forests in the continental United States is the Gila National Forest (3.3 million acres!) The Gila consists of the Aldo Leopold Wilderness, the Blue Range Wilderness, and the Gila Wilderness. Most noteworthy is the Gila Wilderness. On June 3, 1924, it was set aside as the first nationally designated wilderness. Happy birthday to the Gila Wilderness! So what is the Gila Wilderness? It is the largest designated wilderness area in New Mexico. 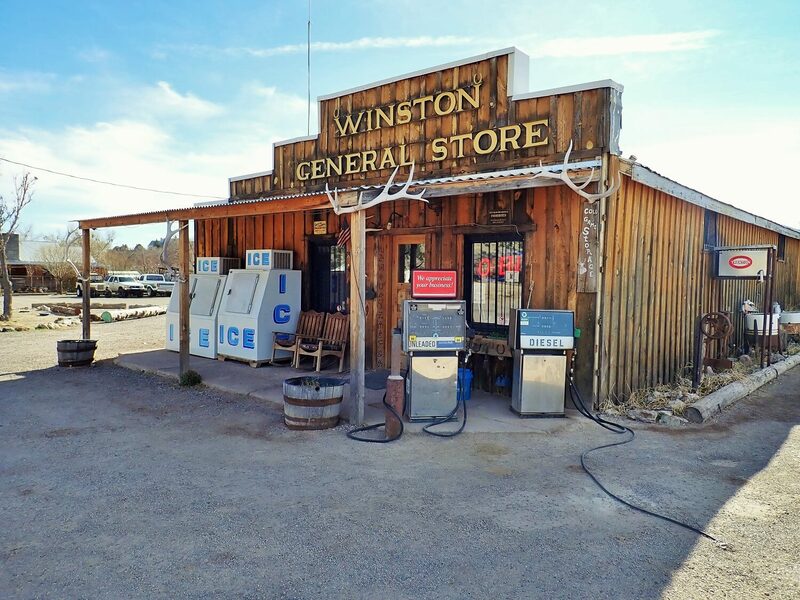 It is located in southwestern New Mexico, north of Silver City and east of Reserve. More than half a million acres in size, it covers both Catron and Grant counties. The West, Middle and much of the East Fork of the Gila River are within its boundaries. They are the longest free-flowing rivers in New Mexico. 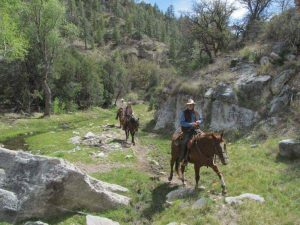 Geronimo Trail Guest Ranch doesn’t take you into the Gila Wilderness directly. However, you can still view it on many of our horseback rides. 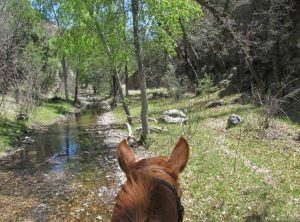 For instance, several of the trail rides at Geronimo Trail Guest Ranch take you to the start of the East Fork of the Gila River. Also, atop one of our viewpoints, you can gaze upon the Mogollon Mountains which are within the wilderness boundaries. The Mogollons contain Whitewater Baldy: the tallest peak within the Mogollons at nearly 11,000 feet elevation! Finally, in the northeast corner of the Gila Wilderness, you can find Black Mountain (9,303 feet). Black Mountain is less than 10 miles from Geronimo Trail Guest Ranch and is one of our local landmarks. What makes U.S. Wilderness Areas unique is that they do not allow motorized or mechanized vehicles. This even includes bicycles. Roads, buildings, logging, mining, etc. are not permitted. Only foot and horse traffic is allowed. However, the Gila Wilderness is not completely untouched. The Mimbres people lived in this area 1,000 years ago, leaving behind cliff dwellings, pottery, and other evidence of their culture. 500 years ago, the Chiricahua band of Apache came into the Gila and dominated through the late 19th century. Geronimo himself considered his birthplace to be at the headwaters of the Gila River. 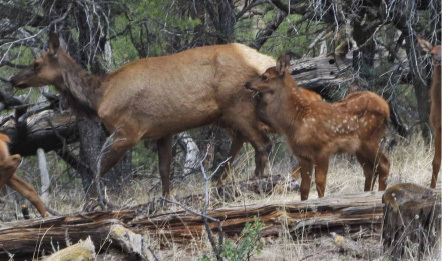 Less than 50 years after the Apaches were gone from the forest, the National Forest System designated the Gila Wilderness the first wilderness area. 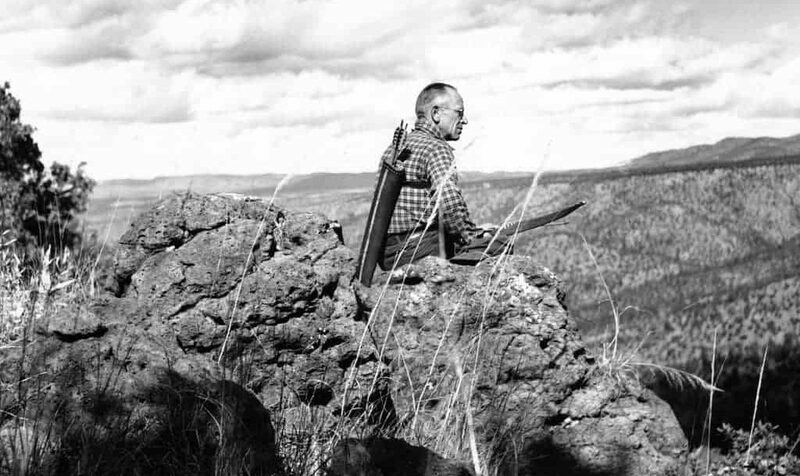 Aldo Leopold is considered the father of the United States’ wilderness system. He was a renowned conservation pioneer. His vision was to set aside large tracts of undeveloped land. He wanted to give people an opportunity to escape. As is still true today, the urbanization of America constricts people to landscapes filled with cars, buildings, and other trappings of civilization. In his classic text, A Sand County Almanac, you can read more about Aldo Leopold. “Wilderness is the one kind of playground which mankind cannot build to order…. I contrived to get the Gila headwaters withdrawn as a wilderness area, to be kept as pack country, free from additional roads, ‘forever.’” Draft foreword, Companion to A Sand County Almanac. After the Gila Wilderness became the first federally recognized Wilderness area in the country, it served as a model for future wilderness preservation. Leopold worked for the newly formed Forest Service whose management policies of its vast natural resources was for the betterment of humanity. However, after spending time out in the wild, Leopold’s opinions changed. He began to believe that the best management policy for natural resources would be to simply leave them alone. Leopold had spent time in southwestern New Mexico and felt the Gila was the best choice for wilderness preservation. Not only had the Apache’s kept settlers out for hundreds of years, but the topography of the region had also prevented development. 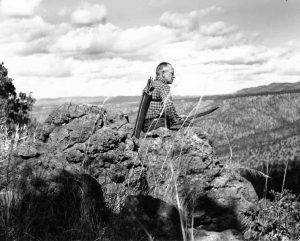 In honor of his contributions, a quarter million acres next to the Gila Wilderness was set aside as the Aldo Leopold Wilderness. What better way to celebrate the birthday of the Gila Wilderness than by booking your trip to Geronimo Trail Guest Ranch today? Contact us for availability. Dude Ranch vs. 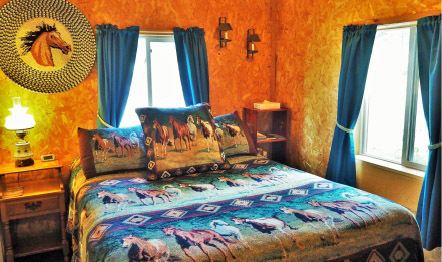 Guest Ranch. What IS the difference?! 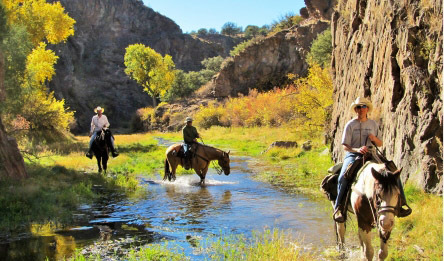 — Is a Ranch Vacation a Good Fit for Your Next Vacation?